Nearly 1 in 5 children in the United States is obese, according to the CDC. This hour we'll take a look at what is being done to counter this trend. 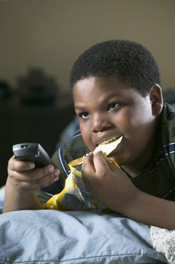 Nearly 1 in 5 children in the United States is obese, according to the CDC. This hour we’ll take a look at what is being done to counter this trend. Our guests are Dr. Allan Noonan, Dean of the School of Community Health and Policy at Morgan State University, Dr. Verlyn Warrington, Pediatric Expert on Childhood Obesity at the University of Maryland Medical Center, Chauncey Whitehead, Fitness activist and trainer, and Michael Young, former Orioles outfielder and childhood obesity activist. Join us this Thursday, April 28, 2011, from 7-9pm at the Enoch Pratt Library’s Wheeler Auditorium for Get Fit Families, a town hall meeting for parents to discuss childhood obesity.